Bad smell coming from your garbage disposal? Here are some quick ways to deodorize it! The garbage disposal unit is one of the most useful items in a kitchen. It’s great for eliminating waste and keeping your sink nice and clean. However, you may notice a nasty stench coming out of it from time to time. In many instances, the smell is a normal result of everyday use since food can get trapped in the blades and rot if not properly ground up. It’s important to know how to get rid of the odor promptly to prevent the smell from spreading to the entire kitchen! Here are some remedies to help you deodorize your garbage disposal. Many cleaning solutions use lemon as a deodorizing scent and you can apply the same principle to your garbage disposal. Cut the lemons into small sections, make sure to peel off the rind, and toss down the disposal as it is grinding to help get rid of that nasty smell! Ice cubes will help remove strong odors from your sink. As an added bonus, the ice cubes can also help to sharpen the blades of the disposal unit and clear away any food that might be stuck in there. Pouring a mild bleach down the garbage disposal in addition to cold water can help disinfect the insides of your garbage disposal and clean your pipes. It also helps dislodge and disintegrate the little particles of food that may be trapped as well. Not every nasty smell will come from inside of the garbage disposal. Make sure you also check the lid of the unit and clean that with soap, water, and a brush! You can also clean the inside of the garbage disposal with a dish or wire brush. BE VERY CAUTIOUS! 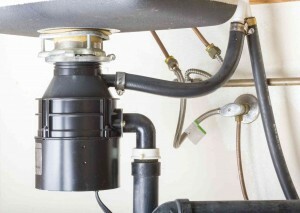 You must unplug AND DISCONNECT the entire unit before trying to put a tool or hand inside the garbage disposal. If all else fails, you can purchase specially formulated drain cleaners to help clear out your garbage disposal and any lingering smells coming from it! This entry was posted on Wednesday, February 8th, 2017 at 9:40 pm. Both comments and pings are currently closed.